So you are the happiest woman alive – he proposed and you said ‘yes’. Still, there is one question that worries you: wedding dress shopping. If you boast some definite curves, your joy on getting married might be marred by the thought of the upcoming ordeal. Yes, we’ve got to admit: plus-size shopping is never easy. Well, shopping for a plus size wedding dress can be a little bit frustrating. We are here to give you a hand. Some very useful tips are definitely on the way. Don’t let your size define your wedding gown shopping experience and steal away the fun involved. Get ready for our ultimate checklist of dos and donts for a curvy bride! As many other plus size women, you are probably worried about your looks on your wedding day. Well, you know what? You shouldn’t be. Your fiance loves you the way you are – there is a reason he chose you, so just be yourself. Don’t let anxiety ruin your big day. You are size eighteen – so what? Love yourself and every single inch of your body. All of us have our own nuances – the important part is to know your strengths and hide your weaknesses. The beauty lies within – and this is one of the first things you should remember. Nothing can compare to that radiant look of pure joy, that a happy woman possesses. You are getting married to the one you love, so rejoice. Some days you might feel not so great about your body – well, that’s definitely not the day to do the fitting then. The second point about loving yourself is to be realistic. You are going to need a dress you will feel comfortable in, the one to highlight your curves and take care of your flaws. Nobody’s perfect, you know. Probably it won’t be easy, wedding shopping is always hard. Just try to keep your positive attitude while searching, and you are sure to get the result that’s totally worth it. Take a look at the mirror, smile your best smile and tell yourself you are beautiful. That will give you a good start. Before you ever get to the point of finding bridal shops in your area, you should be deciding on the budget for your dress. Buying a wedding gown is an important part of wedding planning. You can use this chance to start your first budget planning as a family. 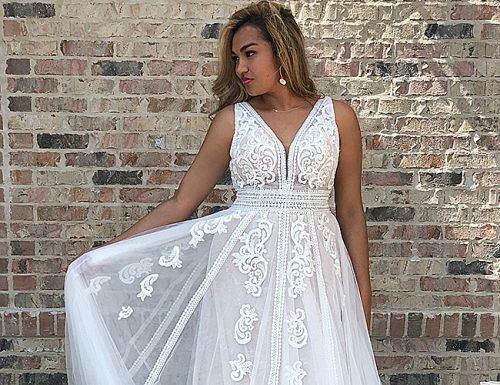 Plus size wedding dresses can be a little bit more expensive. As a rule, they will also need a bit more fitting. Keep it in mind when planning your budget. It’s very important to know in advance how much you are ready to spend. Once you get to the bridal shop, make sure your consultant or salesperson knows your price range. It will be absolutely devastating to find the perfect dress you absolutely adore, that costs five times more you can afford. Ready-made dresses are more affordable, but it will be harder to find exactly the one you want. Custom tailored dresses are more expensive, but they are totally worth every cent. This way you are sure to get as much attention as possible and to have the dress that fits you perfectly. Before you visit stores – make yourself a favor and save your time and nerves by calling the stores first. Most wedding stores can afford only one sample size dress, which means they probably won’t have any plus size clothing to try on. Normally they would have a sample dress in size 10, which is sure to make your experience quite frustrating. Guessing what it’s going to look like on a different kind of figure can be difficult – so you will definitely need help. Be honest and don’t try to diminish yourself. Tell them your size (no guilt here!) and hear what options they can offer to make the fitting process more pleasant. You would be surprised, but the first step to choose your perfect dress starts with the plus size wedding lingerie. Before you go on a shopping spree, you need to decide if you are going to use shapewear or not and choose the wedding underwear. Take several things into consideration: on one hand, you will definitely want to look your best, and shapewear can do a lot to make it work. On the other hand, it is also extremely important to be comfortable – it helps to feel more relaxed. If shape undies make you feel squeezed, probably it’s better to find a dress that looks amazing without any extra help. Never go dress shopping wearing black or color underwear – you won’t be able to see the dress as it is. Another thing to consider is that the wedding dress industry is all about cuts and silhouettes. They will look different depending on what you wear underneath. Also, a right bra is important – you don’t want to flash anything extra on your wedding day. It is better to know exactly what is going to be underneath that dress when you start shopping to make sure they go together. Take care of straps and all the unnecessary details on your underwear. And last – but not least! This is your wedding day, followed by a wedding night. The bridal underwear is important, and it should make you feel beautiful. Set that festive mood by choosing the best bridal underwear possible. You are definitely going to need the one that will make you look and feel fantastic. There are certain styles that usually look great on a size eighteen body. Of course, it will be wise to start with one of them. If you are not sure what to choose, take a look at our shopping guide, but here are the best styles that experts recommend. A-line will look very flattering, especially one with an empire waist: it starts right under the bust and immediately goes out into an A-line. A dropped waist corset dress helps to create curves: a bodice top makes your waist look smaller, while the skirt accentuates the hips. Ball gowns are an excellent choice if you have a pear-shaped figure. Not only will they show your smaller upper half and hide the rest, but also make you feel a royalty. Do pay attention to gowns with a built-in corset: they give you the appearance of a smaller waist and a flatter your bust. Do remember that, although there are some typically flattering plus-size styles, there is no ‘right’ or ‘wrong’. If you like the dress – try it on. Apart from the silhouette, consider the choice of fabrics. Thin fabrics can accentuate every small detail under the gown, and you do not need it. Still, it is important to be you. As you try on dresses, think about what you like, and don’t limit yourself if you like the dress. The perfect dress is the one you like and feel great wearing. Narrow down the list of what you like and start looking for it. You might want to lose some weight for the wedding. But the truth is it takes a lot of time to choose the dress, so you might as well start right now. Any quick way to lose weight will give you a yo-yo effect, which you do not need. A healthier slow weight loss will leave you enough time to fit your dress in accordance with your changing figure. Plus, the longer you wait, the fewer options you have. Wedding gowns can take from six to eight months to come in. If you wait too long you will have to deal with what’s left. Add the time you will definitely need for any alterations – and you’ll understand that you need to start as early as possible. After all, your fiance loves you the way you are – so don’t go too hard on unhealthy dieting. You are a newcomer to the wedding dress world, so you will definitely need help. It might be your maid of honor, a friend, a relative or even a professional stylist. Just don’t take too many people with you – having too many assistants can make the whole experience quite difficult. Do take only those people who will boost your confidence and be supportive. When shopping for your wedding dress, you should be happy and excited. The right companion will make your day much more fun and memorable. Here are some very important factors to consider that might make your decision a bit easier. Choose someone who will be honest with you about their opinion of your options. The last thing you need is someone telling you that every dress is perfect on you. When you’re shopping, having the honest perspective of a close friend or family member can help ensure you get the right dress. While honesty is really important, you don’t want honesty that makes you feel horrible when you’re wedding dress shopping. 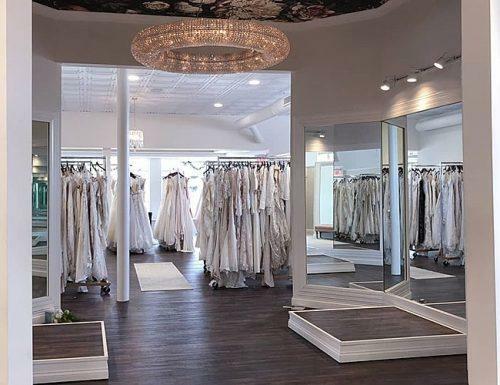 Choosing someone who is kind in their honest appraisal of your dress options is essential to having the best possible wedding dress shopping experience. Honesty is good, but snarky comments aren’t. Remember, you’re going to be making memories on this excursion, so choosing the right companions is essential to your memory of your wedding dress shopping and planning. 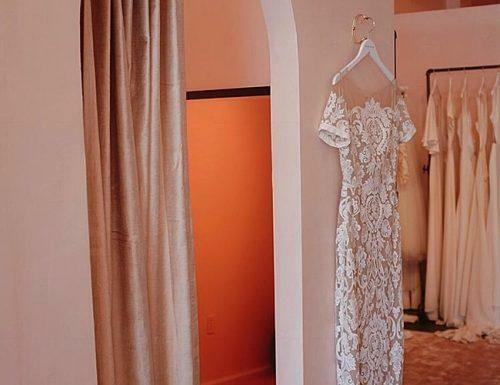 You’re going to remember shopping for your wedding dress for the rest of your life. Make sure whomever you choose is someone that you’re close with; whether it’s your mom or your very best friend, wedding dress shopping is important and should be shared with someone you love. The memories of your shopping trip won’t mean as much if you choose some random friend to go with you. Relatives who are unkind should not be accompanying you, and this is not the time to try to mend fences with anyone with which you’ve been having problems. Your wedding dress shopping trip should be about you; don’t bring along anyone who doesn’t understand that. If you’re not sure about fashion trends, you should choose a wedding dress shopping companion that has a good eye for fashion. 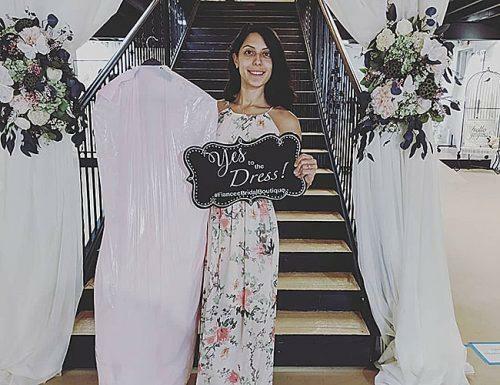 At least one person who is close to you has great fashion sense; it’s really important to take their advice when it comes to your wedding dress. Your fashion-forward shopping companion can help you choose a dress that is flattering, fashionable and beautiful. This companion should also know your taste in clothes. 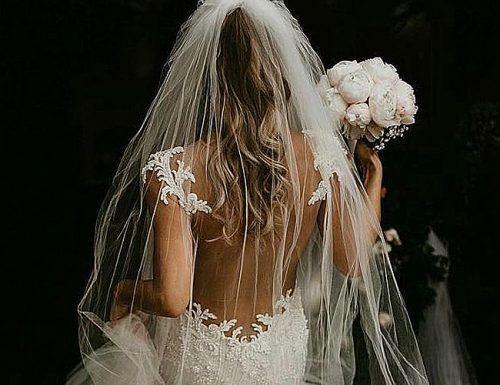 Good fashion advice from someone who understands your clothing tastes will result in a beautiful wedding dress you’ll be proud to wear down the aisle. There are several details, that are important for a plus-size bride. Even if you want a plain and simple wedding dress, you might still need to consider several things. Straps. Having a strapless gown is on the top list of regrets of plus-size brides. You don’t want to ruin your day and photos trying to control your bust, thinking about armpit fat, and adjusting a bra. A sleeved dress or thick straps can make all the difference in the world. Sleeves. If your arms make you feel uncomfortable, you might want to cover them up. If you choose between a bigger size and a smaller one, choose the one that is larger. It is easier to alter the dress to be smaller where it needs to be, than it is to alter it to be bigger. Consider asymmetrical detailing: it is both more flattering and unique. The asymmetrical hem will draw the eye and balance out the upper part of the waistline of the body. An asymmetrical gown is one of the best wedding dress shapes for plus size brides. You have visited every single wedding shop nearby and left empty-handed? 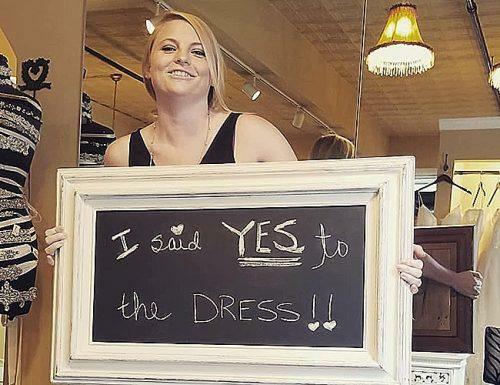 You deserve to have the dress you are dreaming about! All you need is to find the right designer. Getting a custom dress made doesn’t have to be as expensive as it seems to be. Do your research, ask for advice and find the tailors that can help you. Don’t give up and go for virtually any dress that fits. You are beautiful, and you need to feel beautiful on your big day. Beauty is not about being able to fit in wedding sample sizes. If you are a plus-size bride, it doesn’t mean that you need to look bad. It doesn’t matter if you choose a cheap wedding dress or an expensive one – make sure you avoid these mistakes. Walk into the store having no idea what you want. That greatly increases your chances to walk out of the store with something you do not like at all later on. Walk into the store having a very clear idea of what you want. Keep your mind open – sometimes what you find is much better than what you were planning to get. Do not let the salesperson or anyone else control your shopping experience. It is your wedding, your rules. Don’t worry about the size number. Dress sizes vary from brand to brand. More expensive brands often use ‘high fashion’, unrealistic sizes. What is important is you feeling comfortable. Does the dress fit? This is the only thing that matters. Don’t judge a dress while it is still on a hanger. The dress might look great on the hanger and look awful on you, and vice versa. Trust your consultant. If this is your first experience of wedding dress shopping, it can be overwhelming. You need to trust the professionals, after all, you are not the first plus-size bride they see. There is one important detail to a wedding dress shopping. Your shopping should be all about you having fun! After all, it is your perfect chance to buy a most beautiful princess-like dress with lace, sparkles, and layers of tulle (or whatever else you like). You are buying it for your big day to get married to the man of your dreams. You have every reason to be happy and have the best positive experience with your friends and family. Hopefully, our advice will be helpful – shine bright and enjoy your shopping!